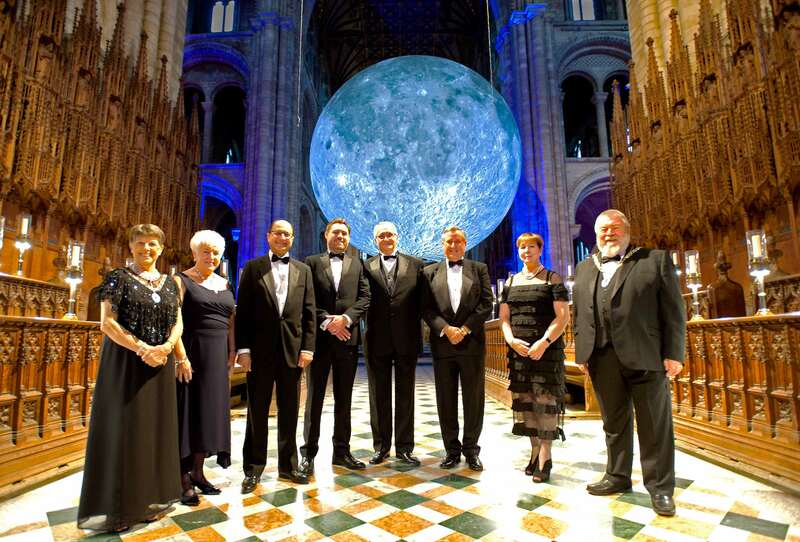 Over 460 delegates from across Peterborough’s businesses came together for a spectacular black-tie event under the moon to celebrate the city’s continued economic success at the Opportunity Peterborough Bondholder Dinner on Thursday 4 October. Organised by the city’s economic development company, Opportunity Peterborough, the Bondholder Dinner is one of the most highly anticipated events in the city’s business calendar, celebrating local businesses’ contribution to Peterborough’s continued growth and success. The event also featured an after dinner talk from The Very Revd Chris Dalliston to celebrate the cathedral’s 900th anniversary year and acted as a special preview of the Museum of the Moon. Museum of the Moon is an art installation created by UK artist Luke Jerram and was secured for the event thanks to the support of Vivacity and the Without Walls programme of which it is an Associate Touring Network partner. The exhibition will be in the cathedral until 14 October. Opportunity Peterborough would like to thank joint headline sponsors, Harvey Spack Field and Bride Hall Developments, partner sponsors, Barclays, Barker Storey Matthews, Barnack Estates, Buckles Solicitors and Propiteer Hotels, drinks sponsor Weston Homes and with special thanks to Vivacity and Without Walls Network for enabling access to the art installation. Headline sponsorship is available.